Dr. Carolyn Dean is both a medical doctor and a naturopathic doctor. Dr. Dean graduated from Dalhousie Medical School in Nova Scotia in 1978. She is also a graduate of the Ontario Naturopathic College and is a long-standing board member of the Canadian College of Naturopathic Medicine in Toronto. Dr. Dean began practicing integrative medicine in 1979 and is aware of the value of both traditional and alternative medicine. In her practice she uses a variety of medical and alternative treatments that include nutrition, herbs, homeopathy, oral vitamins and minerals, IV and IM vitamins and minerals, acupuncture, bodywork, light therapy, and prescription drugs when indicated. Yeast overgrowth has only been recognized since the early 1980’s when Dr. Orian Truss wrote The Missing Diagnosis and Dr. William Crook wrote The Yeast Connection based on clinical observations in their practices. In her naturopathic training, Dr. Dean learned about the tendency for normal yeast in the body to grow out of control under the influence of antibiotics, birth control pills, cortisone, and a high sugar diet. In the early years of her practice she was able to recognize and treat this condition and became a widely sought after yeast expert. Dr. Dean has authored over 11 books to share her extensive knowledge in both traditional and alternative medicine. These titles include: The Yeast Connection and Women’s Health, The Miracle of Magnesium, IBS for Dummies, Hormone Balance, Homeopathic Remedies for Children's Common Ailments, Everything Alzheimer's, Death by Modern Medicine, and The Complete Natural Medicine Guide to Women’s Health. 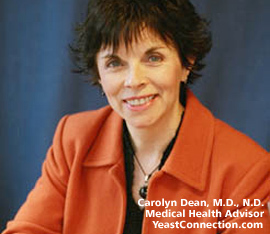 In her role as medical advisor to YeastConnection.com and as a complimentary service to our readers, Dr. Dean regularly answers questions that are emailed through our “contact us” link. She also offers private fee-for-service telephone consultations. In these sessions, she can provide more in-depth attention to your health and wellness issues and give you advice from her 30 years of experience in the successful treatment of yeast overgrowth. You can reach Dr. Dean through her website carolyndean.com.